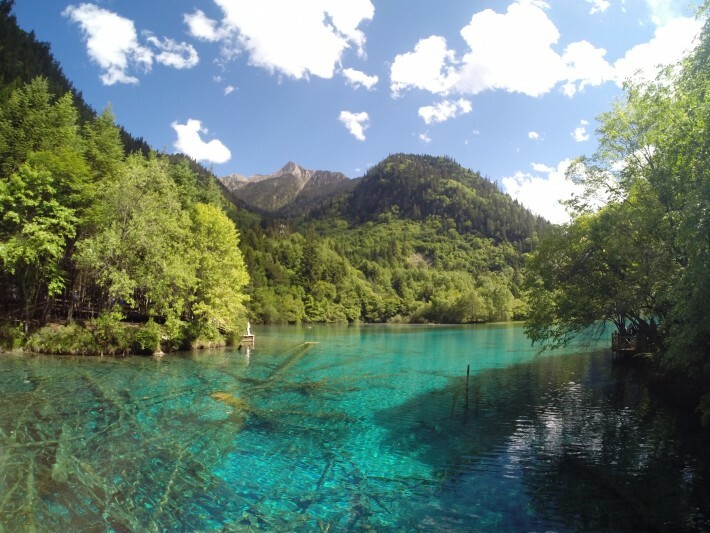 Jiuzhaigou valley offers many beautiful lakes with breathtaking bright colours. 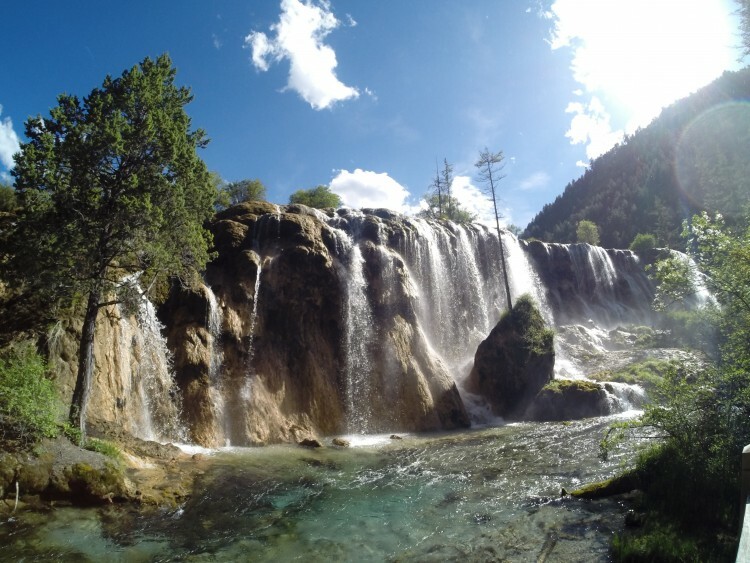 This national park is located on the border of Tibet in, on your way to the remote village of Jiuzhaigou you will get in touch with some interesting Tibetan culture. In this article you find the most relevant Jiuzhaigou travel information. 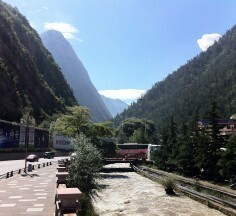 We decided to take the bus from Chengdu to Jiuzhaigou, which takes about 9 hours for 400km. We bought our tickets at Hello Chengdu International Youth Hostel, caught a cab to the Chengdu long-distance busstation and were just in time for our bus departing at 8am. Be prepared for an adventurous ride, with beautiful sights, louds of yaks and Tibetan faces on your way to Jiuzhaigou. Adventurous? Yes! Our busdriver, as well as all other drivers on the way, are always in a hurry. That means that the biggest busses will try to pass each other and they are contantly using their horns. Try to forget that stuff and enjoy the scenery because it is beautiful! 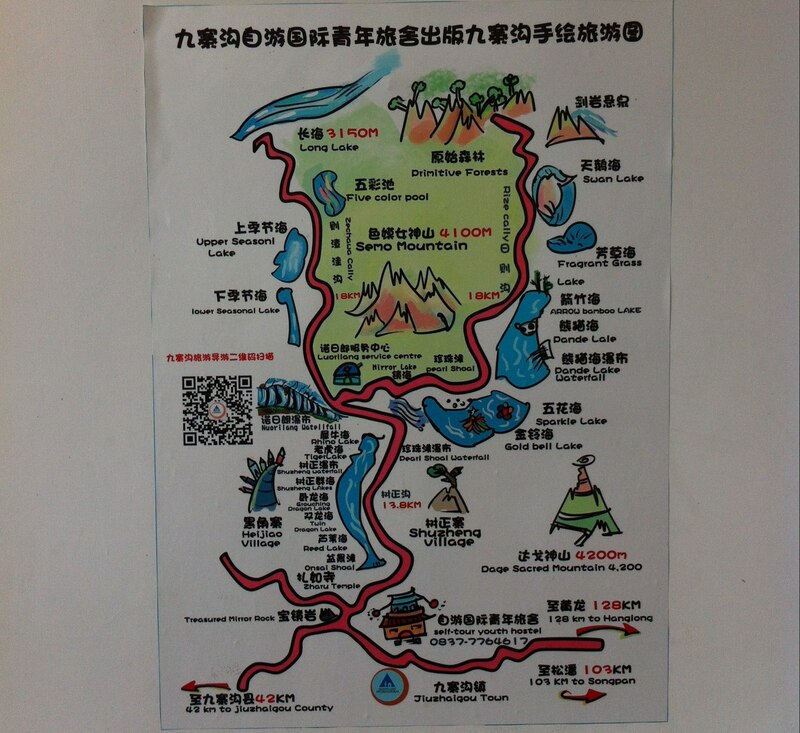 Bustickets from Jiuzhaigou to other cities, in our case Chengdu and Chongqing, can be bought at the long-distance busstation in Jiuzhaigou. We bought our tickets at arrival, so we were sure that to have a seat 3 days later. The staff doesn’t speak English, so we showed the city names on a paper in Chinese characters at the ticket windows: Chengdu (成都) and Chongqing (重庆). Be sure to show it in Chinese characters, otherwise they won’t understand. From the long-distance busstation it is a 15-minutes walk to the village centre were all hotels and hostels are located. On your way to the village you will pass an ATM (China Construction Bank & ABC Bank) and the national park entree, only the China Construction Bank ATM worked for my European bankcard. 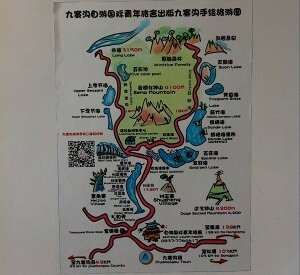 Busticket Chengdu to Jiuzhaigou: around 230 RMB (€25, 10 hours), four daily. Chongqing (200 RMB, 12 hours), Guangyuan (88RMB, 8 hours), Huanglong National park (45 RMB, 3 hours), Lanzhou (237 RMB, 11 hours), Ma’erkang (150 RMB, 9 hours), Songpan (33 RMB, 2 hours). Fly to Jiuhuang (Jiuzhaigou – Huanglong) Airport. 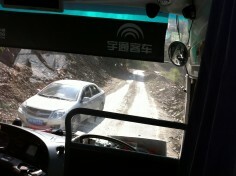 Then take a bus (2 hours) to Jiuzhaigou for 45 RMB, or a catch a taxi around 200 RMB. 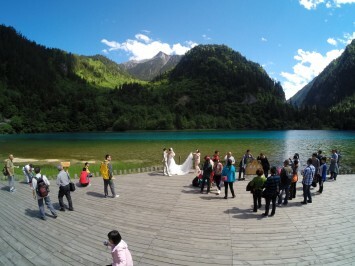 Jiuzhaigou is a small village in the valley between the beautiful mountains. The village consists mainly of hotels and hostels. In the daytime most tourists visit the Jiuzhaigou national park which is only a 10 minute walk away from the centre of the village. In the evening there isn’t much to do in the village, our entertainment was watching Chinese dancing at a square. We couldn’t find a real hostel like we were used to, but Angelie hotel also offers cheap and good rooms, warm showers, some English speaking staff and a Western breakfast which we really appreciated. We also tried a hostel with a ‘Hostelling International’ logo although this one can’t be found on the internet, this hostel also offers cheap rooms and some English speaking staff, but no meals. This hostel was directly on the opposite of the Angelie hotel. 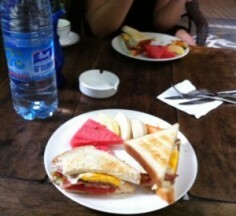 Price for a two person room: around 45 RMB per person. We didn’t make a reservation for the hotels (May 2014). 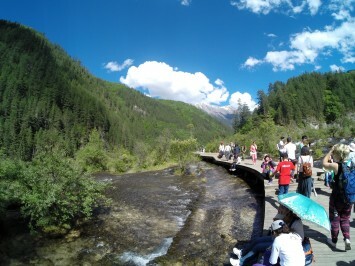 Jiuzhaigou valley, were the village is located. 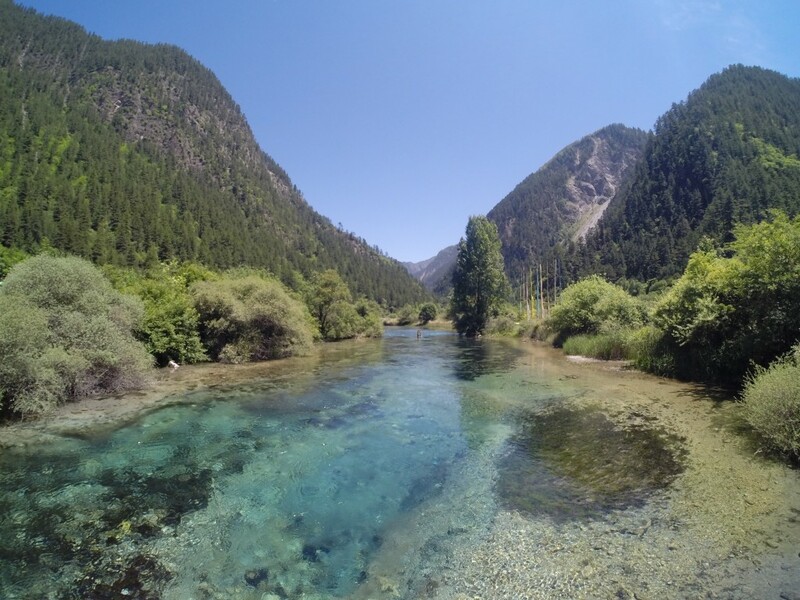 Jiuzhaigou National Park is a 10 minute walk from the centre of the village Jiuzhaigou. The park consists of 2 roads which are basically shaped in an “Y”. On both roads busses are driving between every lake all day. The first day we took the buss up to the right sided way and walked all the way down till the intersection. The second day we didn’t buy a busticket (which is only checked at the entrance), walked all the way to the intersection, and took the bus (yes, ride for free) up the left road and went also down by bus. The lakes and waterfalls at the right side of the park are definitly more beautiful. Some lakes at the left side were dehydrated in our case. The right and left side are far more crowded, loads of Chinese tourists walk their with you, although most of them take the bus between every lake which is not needed. To avoid crowds we would recommend to walk at least one day from the entrance to the intersection, this took us 4 hours in a regular relaxed tempo. This part of the park is really peacefull and really beautiful as well, although most Chinese tourists skip this part. On the other hand, you can’t miss the right-side road because of the breathtaking colorfull lakes. A lot of tourists at the right road/side of the park. Take the bus to Jiuzhaigou, walk to the centre of the village and search for a cheap hotel. Angelie Hotel is in our eyes a cheap and good option. 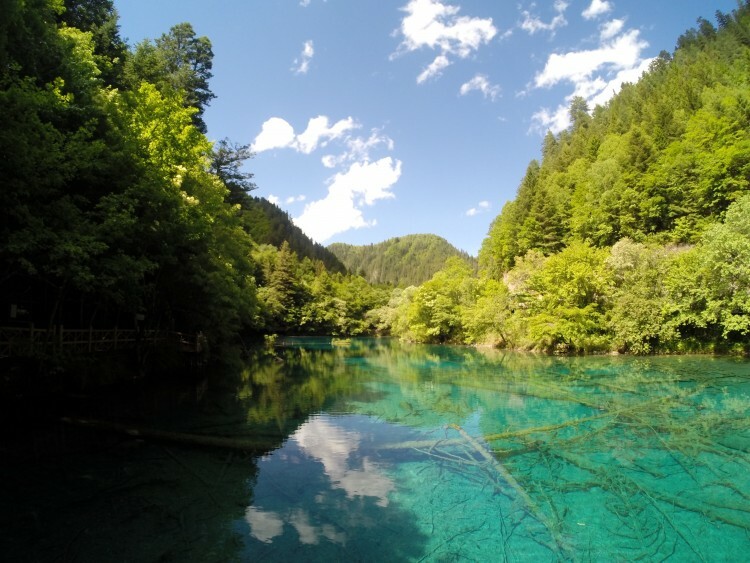 Visit the Jiuzhaigou park for one or two days, if you want to see everything you should spend two days. Buy the national park tickets at least one day without busticket to save money, this is a bit exciting, but they will only check it at the park entrance. Choose the left entrance (pedestrian entrance), don’t be afraid of the security guard. You have to walk at least untill the first busstation (20 minutes). Personally we hopped on the bus at the intersection. You can also try to buy the tickets with students discount, show a card at the ticket window which could possible be a student card. For your evening meal skip the Tibetan restaurant in the centre, it is a good one, but also expensive. Dumplings or noodles are a good cheap option in one of the small restaurants. 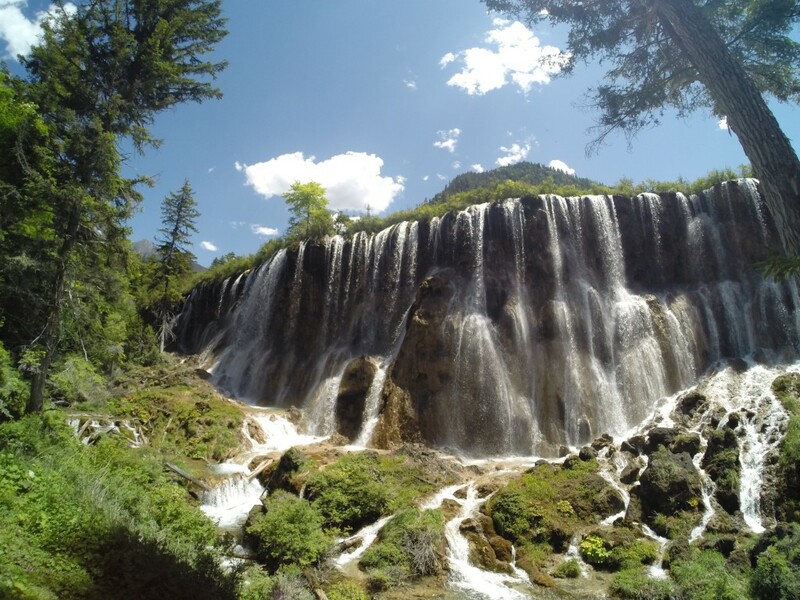 We recommend to spend 2 days in Jiuzhaigou national park, but if you only have one day. Take the bus up to the ride side of the park. Walk down to the intersection, skip the restaurant and tourist shops, and walk down to the entrance. You probably can do this in one day if you start early in the morning. In this case you won’t see the left side road of the park, but in our opinion this is the best way to see the park in one day. From Jiuzhaigou I took the bus back to Chongqing, this was the most exciting bustrip I’ve ever had. 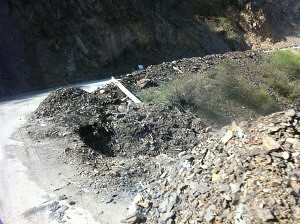 Within half an hour after department we were taken up on small roads at high elevation. The roads were partly covered by rocks from earthquakes in the history, especially in 2008 there was a heavy earthquake in Sichuan. After I was sweating my fear out, the bus bumped into a contruction gap in the road. This time everybody was as shocked as I was, a total silence was the result. After a short break our three (!) busdrivers managed it to get the bus on the road again by placing a stone as a kind of stair. Unfortunately the airconditioning was broken, and we had a lot of weird traffic jams in the middle of nowhere. 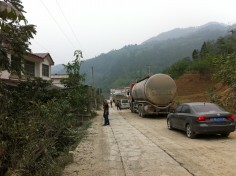 Furthermore we stopped three times on our way to Chongqing to check and repair the engine of the bus. Because I was the only European guy in the bus, it was quite weird and it was difficult to get clear what was happening. But after 14 hours we savely arrived in Chongqing (busstation Lianglukou). IF you are up for an adventure, take this bustrip, even without the accident and broken engine this is a great adventure.